Why Do We Not Talk About This More spotlights pop culture that flies under the radar despite being awesome. 2019 marks the 50 year anniversary of the Zodiac Killer murders, but I can’t tell you that that’s the only reason it’s on my mind. Interest in The Zodiac is one of my constants, one of the true crime cases that I consume the same information about over and over again. Not because I’m looking for some clue others have missed (yeah, right), but because it never ceases to fascinate me — and I don’t think I’m alone. How do you get over a murderer wearing an actual DIY executioner’s hood with a symbol painted onto his shirt? How could a serial killer sending taunting notes to the newspapers and police become boring? And, especially as someone engaged with Hunt a Killer boxes, how could the ciphers he created, parts of which still haven’t been decoded, not ping the curiosity centers of your brain? But while we still talk about the Zodiac as an entity, one piece of entertainment based on the case that failed to make as big a dent culturally as I feel it deserves is David Fincher’s excellent 2007 movie, Zodiac. It gained critical acclaim when it was released, but it doesn’t seem to have the cult following of crime fans talking about it the way one would think. If it happens to come up, those who’ve seen it might say, “Oh yeah! I forgot about that movie,” while acknowledging that it rules. Some of the things that make Zodiac great may be part of the reason we tend to forget it. It’s a pretty understated movie for a killer with so much bombast and showmanship (with the outfit and the fact that he mentioned wanting people to wear buttons with his symbol on them multiple times in his letters, The Zodiac was all about a personal brand). It’s low-key and literally dark, without jump scares or the insane excitement crescendos we’ve since been accustomed to with the advent of the superhero movie. 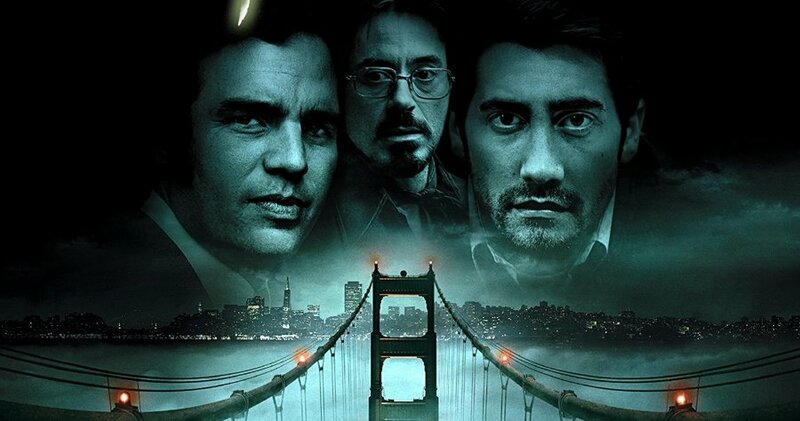 It stars well-liked actors but not massive marquee names for the time, with Jake Gyllenhaal as future Zodiac author and expert Robert Graysmith, a pre-Iron Man Robert Downey Jr. as Zodiac reporter and possible target Paul Avery, and Mark Ruffalo as investigator Dave Toschi. And while I find its grounded approach a strength of the movie, it may have been too down to earth to make a huge mark. The hoopla around The Zodiac is without a doubt “truth is stranger than fiction” legend and the movie depicts it well, but it also spends a lot of time concerning itself with the mundane, yeah-that-seems-about-right lives of his pursuers, without feeling the need to punch up the drama. We see Dave Toschi’s partner apply for a transfer after years of unsuccessfully, frustratingly pursuing Zodiac. When Zodiac goes quiet and people are no longer talking about Toschi as the hotshot cop trying to bring him down, he sends a fake letter to the paper AS The Zodiac, trying to recapture a little of the shine that came with being the hero facing off against the villain. Paul Avery descends into alcoholic isolation after years of being a bundle of repressed nerves in pursuit of the killer. Due to his sustained obsession, Robert Graysmith’s marriage slowly falls apart without even a shouting match. A lot of time is spent on the frustrating lack of cooperation between different police jurisdictions. SCINTILLATING. But does everything need to be scintillating? Zodiac is very human, and that’s a good thing — it’s also insanely gripping and entertaining. It presents plenty of “He did WHAT?” moments, make no mistake. But the reality is that the movie taking the angle of realism may not have stuck in the collective mind as much as it would have had it punched up the more surreal aspects of the Zodiac story and made the detective work more zingy. I think it’s worth dialing down the parts of our brains that need bright lights and action to meet this movie where it’s at, and revisit the mix of the mundane and the insane that makes up Zodiac. Guys, this movie rules. It belongs in the conversation about great pieces of true crime art. Real life is mundane and insane, and the true crime genre is at its best and most responsible when it addresses everyone affected as real humans who went through something, not just the murderer as The Big Bad. What I’m saying is, JUSTICE FOR ZODIAC.